they sound like pots to me. They are crab pots.If you don't own waterfront property that you can tether them to you can't use them legally Without a commercial license. I didn't pay attention that you are in Jersey.I gave you the regs. for MD. do u need a licence to use them in jersey? yes, for pots , for traps you don't. There was a post on here back in may or june I think that had a link to get the permit. I'll see if I can find it and post it for you. You can get all the info here. See the links. 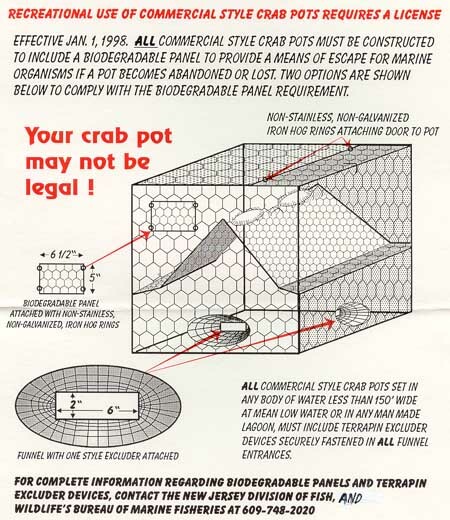 does anyone have a link to the specifics regarding legal crab traps? my cousin gave me 2 that he used in DE and they're fairly new but im not sure they comply with nj law. This link came from the Crab Kings reply 2 posts up, check the other links on that post for more regs. i knew i had checked it out before but didnt realize the link was right there.